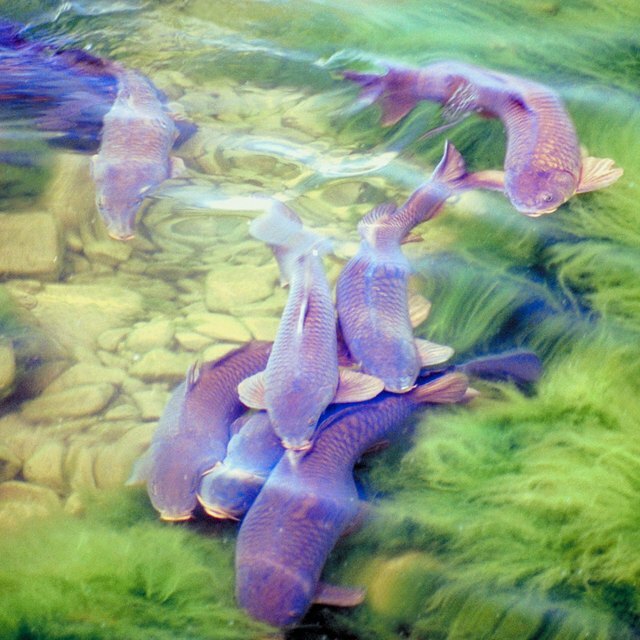 Catfish farming can be practiced almost anywhere in North America. Some forms of aquaculture require expensive equipment and tightly controlled conditions. Catfish farming can be successful on a smaller budget, with basic equipment, then expanded as expertise is developed. Find a market. You shouldn't invest in a fish farm until you have a committed market for your mature fish. This may be a pay fishing lake, private individuals, or local restaurants and groceries. Build or improve a pond. A catfish farming pond should have an average depth of at least six feet. The World Aquaculture Society recommends that a new catfish farming operation should start out with a three- to five-acre pond. Stock the pond. If this is to be a year-round operation, stock the pond in late September or October. If it is a summer-only farm, stock it in April. Stock the pond to a density of about 1,500 fingerlings per acre. This quantity should produce about 2,000 pounds of fish per acre in a year-round pond or 1,500 per acre in a summer-only pond. Begin a winter feeding program. Give the catfish a sinking fish food once every three days at a rate of about one pound of food for every 100 pounds of fish. Place the feed in the same sunlit spot every day so they will learn where to go for meals. If the pond freezes over, suspend feeding until it thaws. At freezing temperatures, catfish do not eat. Implement a summer feeding program once water temperatures reach 65 degrees. Feed the fish once a day between 3 and 5 p.m. with a nutritionally complete fish food. Floating pellets will reduce waste and allow you to monitor how much feed is being eaten each day. Broadcast the feed over a wide area. The catfish should be given as much food as they will eat in 30 minutes. When they have been consuming 30 pounds of food per acre daily for two weeks, they should be ready for harvesting. Provide for emergency aeration. The oxygen levels in a catfish farm pond will vary throughout the day. They are normally at their highest between 3 and 5 p.m. and at their lowest just before sunup. The ideal range for dissolved oxygen in the water is 4 to 5 parts-per-million (ppm). If the oxygen level falls to 3 ppm, as it is likely to do in the hot summer months, some means of raising the oxygen level must be implemented. The least expensive options are an electric bubbler or agitator, or a PTO-driven paddle wheel. Harvest the fish in October. Catfish are harvested by netting. 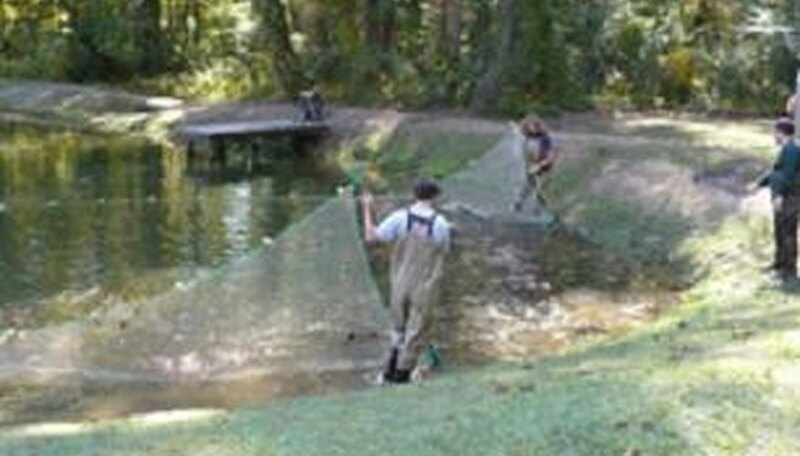 Often, a long net is strung across the pond and the catfish are "herded" into one end of the pond where they can be netted with large hand-held nets. Draining as much of the pond as practical at harvest time will reduce the area available to the catfish. Process the fish. Your end customer will dictate how fish are handled after harvesting. Depending on the situation, you may need a live hauling truck, an ice slurry, or fish cleaning and processing equipment. Restock the pond after harvesting. If this is to be a year-round pond, fingerlings should be placed into the pond immediately after harvesting. If the fish farm will only be operated during the summer, restock the pond in early April. Have a plan in place for dealing with water problems. Chemical imbalances can wipe out a crop. Overly warm water or excessive evaporation can drastically reduce oxygen levels. Be prepared to take steps to deter predators, such as turtles and shore birds. Arrange for temporary help at harvest time. Prior to stocking, pond bottoms must be cleared of stumps, large rocks and excessive sediment. In a closed ecosystem such as a fish farm, disease and water problems can escalate to fatal levels in a matter of hours. Constant monitoring is required. Have a plan in place for dealing with water problems. Chemical imbalances can wipe out a crop. Overly warm water or excessive evaporation can drastically reduce oxygen levels. Be prepared to take steps to deter predators, such as turtles and shore birds. Arrange for temporary help at harvest time. Prior to stocking, pond bottoms must be cleared of stumps, large rocks and excessive sediment.